Identify and recognize the green building characteristics of translucent building envelope systems using high-performance, multi-pane insulated panels. Investigate the design potential and innovative opportunities to create buildings that use translucent facades for natural daylighting and energy-use optimization. Assess the multiple ways that translucent building envelopes and glazing systems contribute to green and sustainable design. Specify insulated translucent wall panels in a variety of green and conventional buildings, and formulate appropriate selections related to specific applications. One of the hallmarks of a green building is the use of natural daylight to create a positive quality of lighting for indoor environments. This feature, when coupled with appropriate electric light switches or controls, also has the added benefit of being able to reduce energy costs for artificial lighting. When electric lights are turned off, they don’t generate heat, so less cooling is needed in a building. Hence, daylighting provides multiple benefits for people and buildings, but how is it best accomplished? New advances in building product technology now make it possible for architects to consider not only window openings for daylighting but the creation of entire daylit building facades. Further, understanding that clear-view glazing is not necessarily the first choice for good quality daylighting, investigation into other options using translucent glazing is warranted. Such translucent systems offer better glare control, higher thermal performance, and easier maintenance compared to clear glass systems. 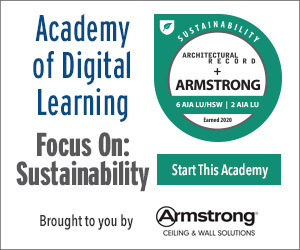 This course will explore some of these systems and the ways that they can contribute to innovatively designed, high-performing buildings that are fully code compliant, green, and sustainable. 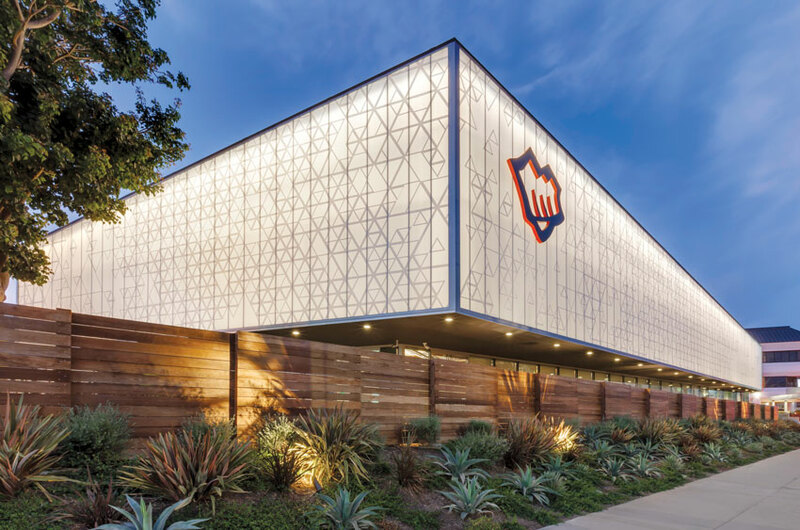 High-performance daylighting facades are possible using advanced systems that combine glare-controlled translucent light with customizable, thermally efficient, two-panel polycarbonate systems and nighttime facade illumination, as shown here. Incorporating natural light into buildings has been part of design and construction since primitive times and has continued throughout all historical time eras in all parts of the world. So why is it seen as something new or different today? Because our building envelopes are different than in historical times. We no longer rely solely on the heavy mass of cave dwellings or masonry buildings to separate the indoors from the outdoors. Rather, we more commonly use lighter-weight structural systems that are clad with lightweight building envelopes that need to provide a series of functions, only one of which is to allow natural daylight. And, just as importantly, that daylight needs to be controlled so that it is useful, without creating glare or other unwanted outcomes for occupants. At the same time, 21st century building enclosures need to meet significant standards for energy conservation in buildings, whether for minimum energy code compliance or to achieve high performance as demonstrated through voluntary certification programs such as LEED. A frequently referenced resource, particularly for government or institutional buildings, is the Whole Building Design Guide. It discusses and defines daylighting for buildings of our era this way: “Daylighting is the controlled admission of natural light, direct sunlight, and diffused skylight into a building to reduce electric lighting and saving energy.” It is noteworthy that it distinguishes natural light from direct sunlight and from diffused skylight. Each of these are indicative of different types of light quality. Regarding the benefits of daylighting, it cites: “By providing a direct link to the dynamic and perpetually evolving patterns of outdoor illumination, daylighting helps create a visually stimulating and productive environment for building occupants while reducing as much as one-third of total building energy costs.” This speaks to both human benefits for individuals who occupy the building and to the successful operation of the building itself as energy efficient and economical to operate. The United States Department of Energy (DOE) builds on this definition and provides some practical guidance for the design of buildings that seek to use daylighting. They start by taking into account the different compass orientations of sunlight striking a building throughout the year. The DOE first points out that “south-facing windows allow most winter sunlight into buildings but little direct sun during the summer, especially when properly shaded.” This statement reflects the changing position of the sun relative to the horizon (i.e., sun altitude) as the earth cycles between summer and winter seasons. Low sun angles in winter have the ability to penetrate deeper into a building than the higher angles in the summer. That can be good at spreading daylight throughout a space and may also help with some welcome solar warmth during cold weather. The reference to shading the southern facade is indicative of common practices used to shield windows from summer sun in order to avoid unwanted solar heat gain in the building triggering more use of air-conditioning. That same shading will necessarily restrict the daylight too. Moving on to other compass orientations, the DOE advises, “East- and west-facing windows provide good daylight penetration in the morning and evening, respectively, but may cause glare, admit a lot of heat during the summer when it is usually not wanted, and contribute little to solar heating during the winter.” These orientations seem to have very little benefit and several challenges, particularly when clear glazing is used. Finally, it points out, “North-facing windows admit relatively even, natural light, producing little glare and almost no unwanted summer heat gain.” Here, the reliance is on sunlight that is reflected from surroundings or is simply ambient in nature, providing even illumination. This is the even, diffuse lighting often sought after in artist’s studios or workplaces with many computer monitors. While it produces no solar heat gain in the summer, neither does it do so in the winter, although for most commercial and institutional buildings, heating is not the primary energy use—air-conditioning often is. Smooth, even, glare-controlled daylight passing through translucent glazing provides numerous benefits to people and energy savings from reduced reliance on electric lights. 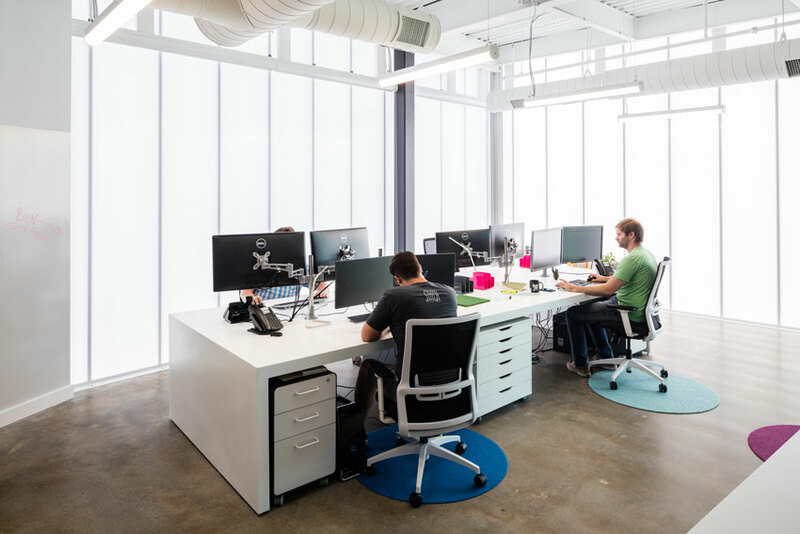 While the DOE is understandably focused on daylighting for energy-related concerns, the U.S. Green Building Council’s LEED rating system addresses it as part of Indoor Environmental Quality. In LEED v4, this EQ credit focuses on the impacts daylight has on people by stating, “Increased access to daylight has positive human behavioral and health effects because it reinforces our circadian rhythms. Access to sufficient daylight has been shown to increase healing times in hospitals, improve students’ performance, increase productivity in the workplace, fight depression and lethargy, and even increase sales in retail environments.” This is a fairly impressive list of human benefits that it backs up by citing a series of independent studies that have drawn these conclusions. In a nod toward the interrelatedness of the rating system with credits for Energy Optimization, it points out, “A well-designed daylit building also uses less electric lighting energy, conserving natural resources and reducing air pollution.” The LEED manual goes on to recommend steps to incorporate and maximize daylight while providing glare control. In addition to daylight in general, views to the exterior are addressed with LEED v4, offering credit if at least 75 percent of the regularly occupied floor area provides views from inside a building to the outside. There are four ways that views are defined, and at least two of those four need to be achieved to receive credit, but none of them require full-height transparent glass. Rather, it is up to the designers to demonstrate how the views are achieved, with creativity and innovation being encouraged. As part of a building design, keep in mind that daylight and views don’t necessarily need to be achieved through the same glazed wall openings. Rather, it is possible to identify separate daylight zones and view zones in a given wall. Typically, the view zone is a horizontal swath along the normal eye level range of people sitting or standing within the building. 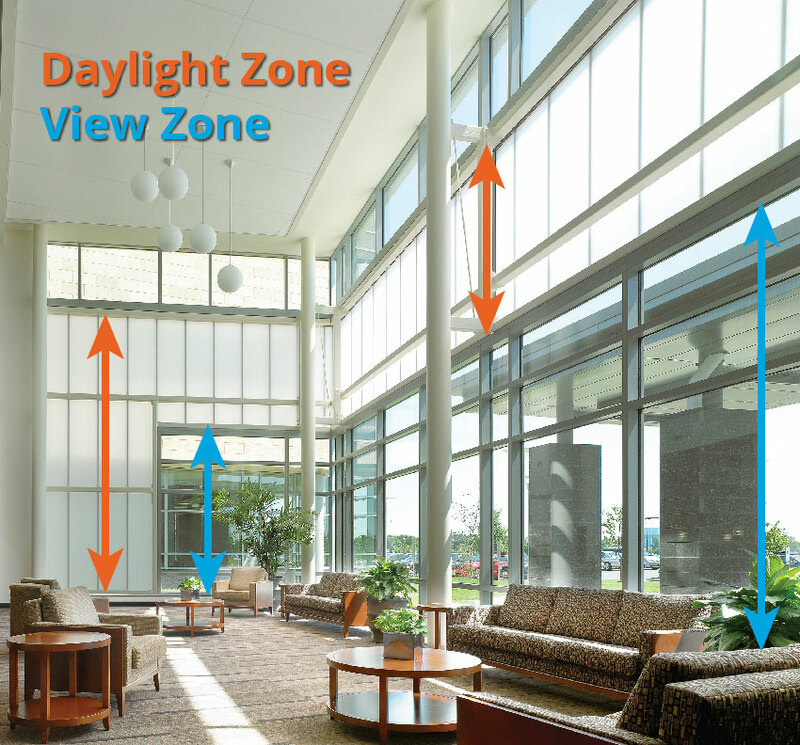 The daylighting zone can be above or below the view zone (or both). With this in mind, and the general location of people in the building defined, it is possible and desirable then to create facades that incorporate the right mix of clear-view glazing and glare-controlled daylighting glazing without a view. The design process may require several iterations to arrive at the best mix, but the opportunity to create unique, artistic, and even iconic facades is real. Exterior building facades can be designed to include clear-view zones that are separate from translucent daylight zones.